The markets are still slow which helps our positions. GOOG is the only position causing problems. We are in a good position to turn it around but will keep a close eye on it. If it starts showing signs of a rally, we’ll have to adjust to what the market it telling us. 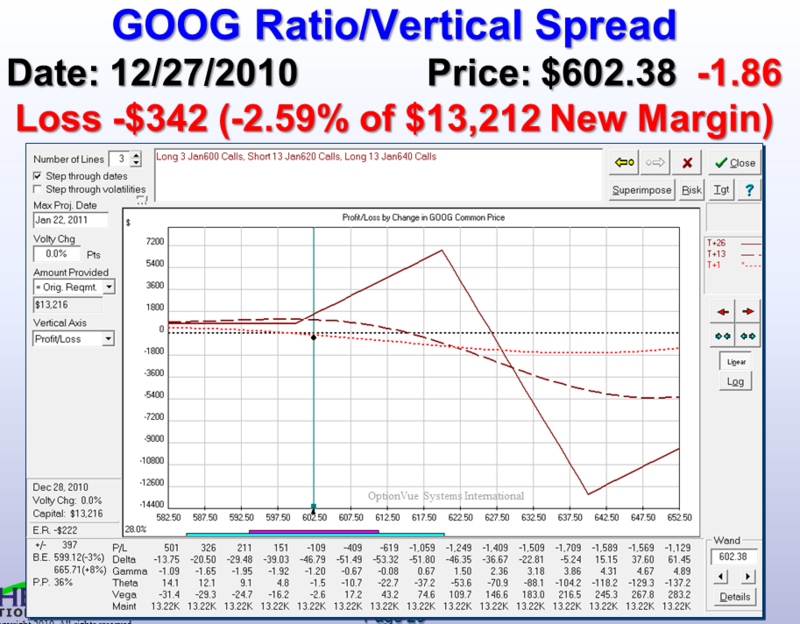 I’d like to reduce the margin on the GOOG trade or even take it off as we have a nice profit on the other two positions. Let’s see what happens with today’s price action. I started using T+1 for the Risk Charts to show you where the standard deviations are. “T+1” means “Today plus one day” (ie..tomorrow). The magenta bar at the bottom is one day, one standard deviation of movement. The blue bar underneath it is a one day, two standard deviation move. 1 Standard Deviation with a normal distribution has a 68.2% probability of being in that range on the specified date. 1.96 Standard Deviations has a 95.0% probability of being in that range on the specified date. You can download a free standard deviation calculator on our website.